A popular penguin at Torquay’s coastal zoo is being treated for a suspected heart condition. Yoyo the macaroni penguin is well known for hanging around the public walkways and greeting guests. The scan was taken at Abbotskerswell Veterinary Centre. A computerised tomography (CT or CAT scan) uses x-rays to create detailed computer images of the inside of a body. The scan was performed by John Harvey, Veterinary Endoscopy and Surgery Referral Clinician and Clinical Director at Abbotskerswell Veterinary Centre. 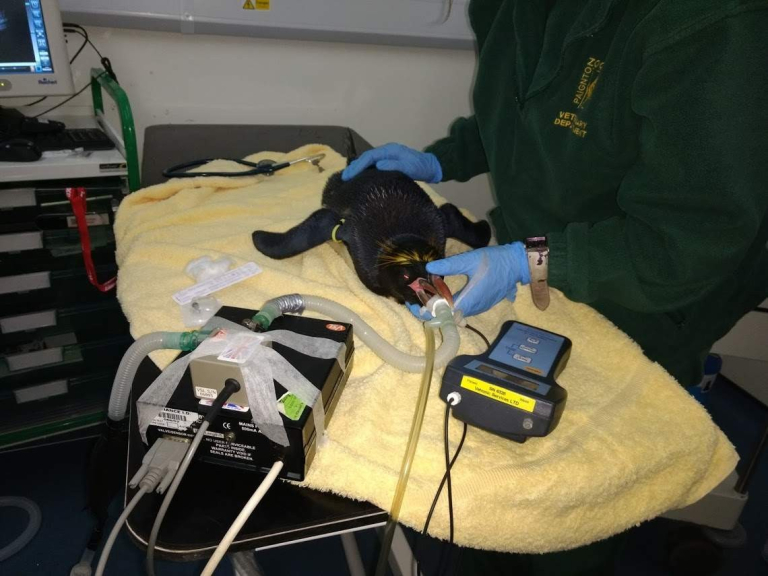 The resulting images were examined and interpreted by external specialists; they detected some abnormalities that suggested heart issues, including the suspicion of a slightly enlarged heart – a diagnosis based on data the radiologist had from other species of penguin. Yoyo was hatched on 27th May 2013, which means he celebrates his fifth birthday this Sunday. His parents are Corin and Blue, but had to be hand-reared by keepers, so he is especially confident around people. Living Coasts is home to 16 macaroni penguins; guests can mix with both the macaroni penguins and the African penguins when they visit. You can also arrange to feed penguins, adopt penguins and even dive with penguins. For more information go to www.livingcoasts.org.uk or ring 01803 202470.